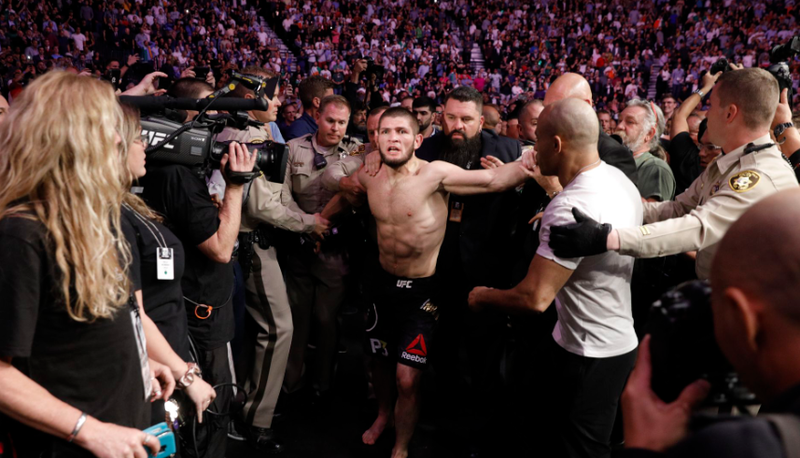 As the Nevada State Athletic Commission attempts to clear the fall out of the UFC 229 brawl, their next step is dealing with the corners of both Khabib Nurmagomedov and Conor McGregor’s for their role in the incident. The fighters named in the agenda for the Commission’s November 14th meeting include McGregor cornerman Dillon Danis, Nurmagomedov co-manager Rizvan Magomedov, and teammates Abubakar Nurmagomedov, Zubaira Tukhugov and Esedulla Emiragaev. Danis, Nurmagomedov, and Tukhugov, were licensed by the Commission for the fight. Danis would be the target of the UFC lightweight champion nearly immediately after he submitted McGregor in the fourth round, with Nurmagomedov’s teammates jumping right in. The fate of McGregor and Nurmagomedov will be decided in a hearing next month, with half of Nurmagomedov’s $2 million purse held up by the commission. NSAC chairman claims that while Nurmagomedov started the brawl by jumping Danis, the others involved need to pay for their behavior as well.